Ed Piskor’s Hip Hop Family Tree, oddly spelled without the hyphen between Hip and Hop, is my favorite webcomic right now. Piskor retells the early years of hip-hop culture in a slightly reverent manner that’s reminiscent of both the biographical comics Marvel published about Pope John Paul II and Mother Teresa in the ’80s and Revolutionary Comics’ early ’90s Rock ‘N’ Roll Comics title, which did unauthorized biographies about Public Enemy, Ice-T and N.W.A., three acts who have appeared as their younger, pre-superstar selves in Hip Hop Family Tree. But Piskor also takes a bunch of enjoyable or imaginative visual liberties with the (well-researched) historical material, like when he exaggerates the lisp of a young (and drug-addled) Russell Simmons to the point where the rap mogul’s dialogue reads like Daffy Duck’s or when he soundtracks the arrest of a teenage KRS-One with onomatopoeia from the future KRS joint “Sound of Da Police” (“Woop! Woop!”). The latter moment with KRS and the officers overseers (actually, they’re not patrolmen; they’re plainclothes detectives who look an awful lot like the Beastie Boys when they dressed up as ’70s detectives in the “Sabotage” video) is one of my favorite Hip Hop Family Tree strips. It’s one of the strips Fantagraphics collected in its third and latest Hip Hop Family Tree compilation, one of the best 2015 graphic novels that has nothing to do with superheroes for a change, as well as a book that has inspired a companion mix of all the tracks Piskor references in the Book 3 strips, curated by Agent J from Groovement. 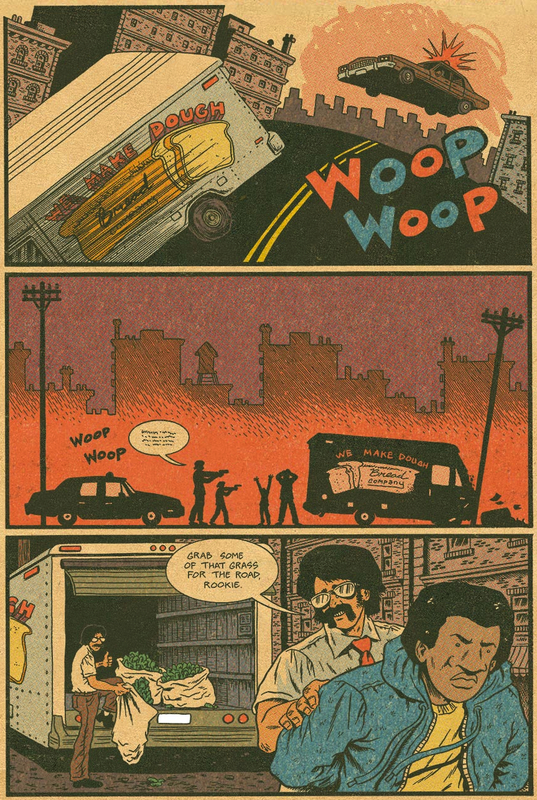 Hip Hop Family Tree, which spawned a monthly Fantagraphics title of the same name earlier this year, is currently chronicling the year 1985. In that year, Def Jam signed a huge distribution deal with Columbia Records and released Radio, LL Cool J’s debut album. Meanwhile, Book 3 covers the years 1983 to 1984. Rick Rubin is still running Def Jam out of his dorm. He also heartlessly tosses drummer Kate Schellenbach out of the Beastie Boys, whose punk sound he’s been reshaping, because he believes “girls don’t sound good at rapping” (but Schellenbach will later do okay on her own as the drummer for Luscious Jackson, one of the Beasties’ ’90s labelmates). A beatboxer named Doug E. Fresh starts building routines on stage with an MC named Ricky D, a.k.a. Slick Rick. Filmmaker Tony Silver and Henry Chalfant, a sculptor who takes photographs of New York graffiti, independently release a documentary about graffiti artists called Style Wars, which becomes one of the most beloved and sampled movies about the rise of hip-hop culture. Michael Jackson’s immensely popular videos for his Thriller singles cause MTV to stop being bizarrely timid about airing videos by black musicians, which spurs Run-DMC and Kurtis Blow to shoot the first post-Thriller rap videos for MTV airplay. A star-studded New York TV show pilot called Graffiti Rock attempts to do for rap what American Bandstand did for late ’50s/early ’60s rock and Soul Train did for soul music. UTFO fails to show up at a gig one night, which leads to a barrage of unknown female rappers recording diss songs as responses to UTFO’s misogynist radio hit “Roxanne, Roxanne.” Ice-T teaches L.A. community center kids how to pop and lock. And KRS is just an artsy kid who wants to tag his name all over town. That’s a lot of characters and arcs to cover, but Piskor juggles them all with the smoothness and confidence of Doug and Rick circa 1984. Lyrically and flow-wise, rap was still in its infancy in 1983 and 1984. If you watch a clip of Fox News and pay attention to what either any of the network’s pundits or its audience of 94-year-old viewers thinks rap sounds like, their idea of rap is rap from 1984. That’s why I don’t like a lot of rap tunes from 1984 — although Run-DMC’s “Rock Box,” which I first encountered through Chris Rock’s “Champagne” in 1997 and whose video shoot at the legendary New York club Danceteria gets depicted in Book 3, has aged remarkably well, and it’s not surprising that “Rock Box” was the late Patrice O’Neal’s favorite tune (“When I first heard this, I got emotional! If I could have cried at a song, it would have been when I heard this”) — and I prefer the ’90s over the ’80s as a decade for classic hip-hop: because nowadays, those tunes sound too much like a Fox News moron’s horrible attempt at rapping. But back in 1984, those tunes sounded fly. While they sound rudimentary by today’s much more lyrically and sonically sophisticated standards, there’s an exuberance to those tunes that’s still appealing, and that exuberance carries over into Piskor’s bold artwork and what he’s cited as “Photoshop trickery” to make the webcomic look exactly like how comic strips would look in color when they used to dominate Sunday newspapers. But in the oversized print editions Fantagraphics has packaged Piskor’s strips in, it becomes much more clear that Piskor, whose Photoshop trickery was inspired by the work of his friend and fellow cartoonist Jim Rugg, is actually trying to recreate Marvel’s giant-sized ’70s “treasury editions” of its most popular comics, particularly the texture of the pages within those giant-sized collections. 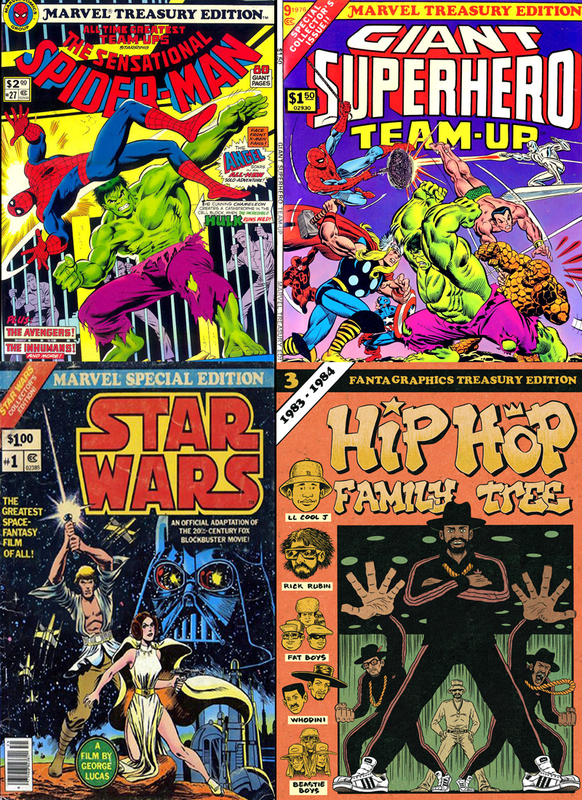 In my favorite aesthetic touch on the Fantagraphics book covers, Piskor and Fantagraphics even use the same Cooper Black typeface from the covers of those giant-sized Marvel reprints. So Hip Hop Family Tree isn’t just a tribute to hip-hop legends. It’s also Piskor’s tribute to Marvel long before Disney acquired it and nurtured it into conquering Hollywood as if it were Thanos conquering an entire universe: the same Marvel that used to occasionally produce weird comics about the Pope and Mother Teresa and was the kind of Marvel Piskor grew up reading. Piskor has said he’s a fan of Chris Claremont’s run as the writer of The Uncanny X-Men, the oft-ridiculed Rob Liefeld’s New Mutants and X-Force artwork and the stories Larry Hama wrote for G.I. Joe. 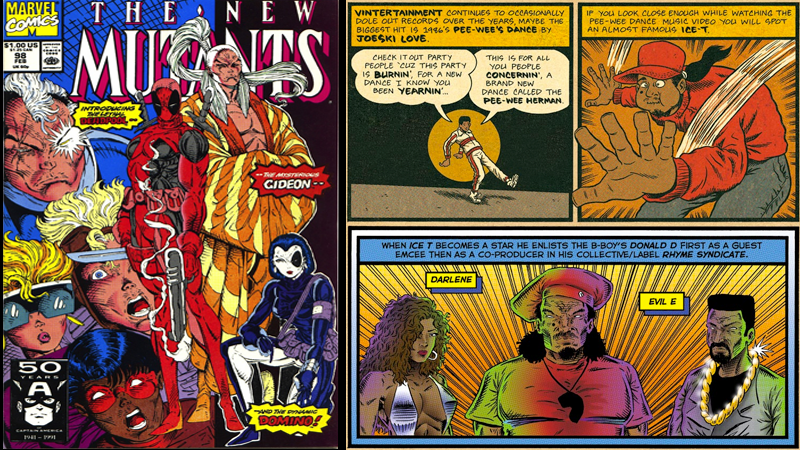 In a Book 3 strip about Ice-T, Piskor reimagines the future cover art from Ice-T’s 1988 album Power as a panel in the style of Liefeld, who started penciling for The New Mutants at around the time Ice-T followed up Power with The Iceberg/Freedom of Speech… Just Watch What You Say! 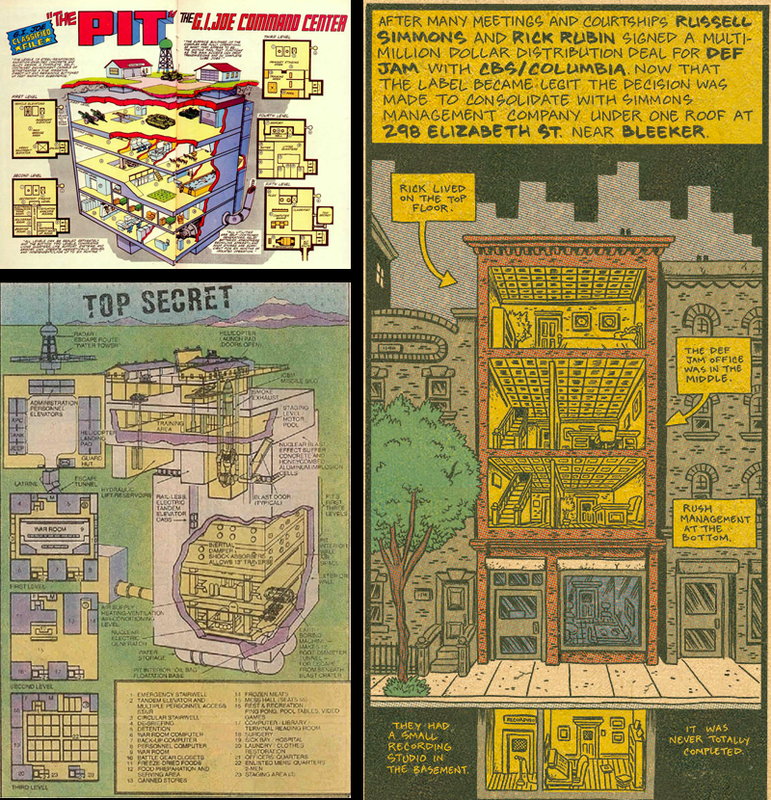 And more recently online, in a strip that’s not in Book 3 but will inevitably be part of Book 4, Piskor takes Def Jam’s new offices and amusingly presents a cross-section of the label’s headquarters that brings to mind all those G.I. Joe cross-sections of the Pit, the Joes’ underground base. Retelling early hip-hop history in the visual parlance of Marvel illustrators from the ’80s and early ’90s is a killer combination, and the third volume of Hip Hop Family Tree proves this combination’s got staying power like Eddie Martinez’s electric guitar licks, Jam Master Jay’s cuts and the verses by Run and DMC during “Rock Box.” Hip Hop Family Tree is rising, surprising and often hypnotizing. Heard of MowJoe? Neither did we, but his experimental Beat Tape is worth a listen. Audio Dope's SOLAR SOLILOQUY is a short music film worth watching. Founder and programmer of the Internet radio station AFOS (A Fistful of Soundtracks), which streams film and TV score music (afistfulofsoundtracks.blogspot.com). Currently based in Silicon Valley but always hated the valley and has forever longed to move to NYC, partly because so much killer hip-hop emerged from there. I've been on board with hip-hop since I was eight and I started contemplating Egyptian philosophical questions like "What is a DJ if he can't scratch?" [10/04] A3C Private Event: Def Jam Recordings x A3C Mixer (RSVP Required)!